(ARA) – Many homeowners wish to turn their backyards into outdoor living spaces, bringing indoor comforts into the fresh outdoor air. Gazebos are uniquely suited to do this by providing a covered retreat that adds distinction to the outdoor living space. Summer is the perfect time to build a gazebo. It can be finished in a weekend, and the design can be as simple or complex as a homeowner desires. Planning in advance will save you time and money. The basic gazebo is eight sides with a railing and peaked roof, but designs can vary to fit your living space and preference. Finishing touches such as lattice or a cupola can add further levels of distinction. Homeowners are presented with three basic options to design and build a gazebo. Talented homeowners can build gazebos themselves with the help of the many how-to books, magazines and Web sites providing step-by-step instructions and gazebo plans. Some companies, like CedarShed or Outdoor Living Today, sell pre-fabricated gazebo kits for the homeowner to install. Finally, a professional can be hired to design and build a custom gazebo. Western Red Cedar is one of the world’s most durable woods, making it uniquely suited for outdoor use. “Western Red Cedar is historically known to resist decay,” says Cheng. The tree’s natural preservatives resist insect and moisture damages. The natural properties of Western Red Cedar can also lessen a structure’s environmental footprint by eliminating the necessity for chemical pressure treatments. 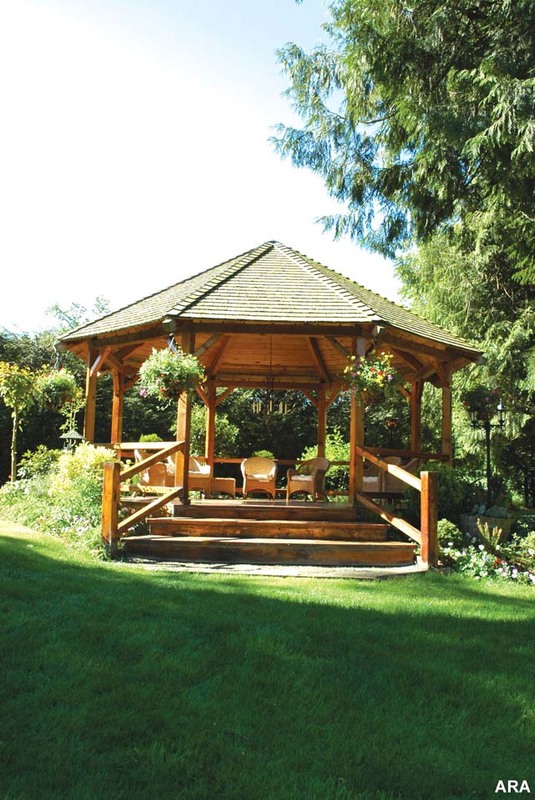 The wood’s natural beauty makes Western Red Cedar a preferred choice for many gazebo designers. It comes in a variety of visual options with different grades and textures that can be artfully combined with stone or plants. To create a different, enhanced hue, choose from a wide variety of finishes. Western Red Cedar is free of pitch and resin, making application a simple process. Clear and semi-transparent finishes are very popular, Mackie says, because they maintain the natural beauty of the wood but offer increased protection from the elements. Be sure to test the finish on scrap material or a small, discrete area of the gazebo before application to the entire structure. A well-designed outdoor gazebo forms a seamless transition with the outdoor living space. Defining elements of the outdoor living space, like water or rock, should be incorporated in the design and construction of the gazebo. Western Red Cedar planter boxes are a simple way to dress up a gazebo and incorporate plants already existing in the outdoor living space. Connecting a gazebo to the rest of an outdoor living space will increase its beauty and the design continuity of the space. Adding a Western Red Cedar gazebo to your outdoor living space is likely easier than you realize. It just takes some planning, the proper materials and an understanding of your outdoor living space. By keeping those things in mind, you can create a covered retreat that adds a mark of distinction to your outdoor living space. For more information on Western Red Cedar, visit the Western Red Cedar Lumber Association Web site at www.realcedar.org.